Is Florida Back On The Map? Marco Rubio just put out a sharply-worded rebuttal to today's talker, the Washington Post's disclosure that the senator's parents left Cuba for Florida in 1956, two and a half years before Fidel Castro seized power -- contradicting Rubio, who often left the impression (including on his own Web site) that they were part of the wave of exiles that fled Castro. If The Washington Post wants to criticize me for getting a few dates wrong, I accept that. But to call into question the central and defining event of my parents’ young lives – the fact that a brutal communist dictator took control of their homeland and they were never able to return – is something I will not tolerate. My understanding of my parents’ journey has always been based on what they told me about events that took place more than 50 years ago — more than a decade before I was born. What they described was not a timeline, or specific dates. But viewed through a strictly campaign-oriented lens -- this is the Stump, after all -- the question the day has left us with is: is Marco Rubio still the presumptive running mate of any Republican presidential nominee, what with his good looks, conservative bona fides, and favorite son appeal for Hispanic voters and Floridians? And if he is still the number-two, how much does this disclosure diminish his appeal, particularly in Florida itself, where there is greater sensitivity to and familiarity with the nuances of Cuban and Hispanic immigrant identity? Before today, a pessimistic Democrat could easily have argued that a ticket with Rubio on it would put Florida out of play; is it now back on the map? ...At least recently, Rubio has not gone out of his way to endear himself to non-Cuban Latinos. Earlier in his career, when Rubio was speaker of the Florida House, Latino political leaders from across the ideological spectrum credited him with helping to undermine several restrictive immigration measures. But, by 2010, as he ran for Senate in Florida, he was largely toeing the conservative line on immigration. He opposed the DREAM Act, which would make it easier for the children of undocumented workers to become citizens. Later, he said the Census shouldn’t include undocumented workers in its population count. With federal funds to Florida at stake, state as well as national Latino leaders attacked Rubio publicly. Today, Rubio’s office says he never changed positions—that he was always more conservative than liberal immigration activists. Arturo Vargas, executive director of the National Association of Latino Elected and Appointed Officials, saw things differently. “The Marco Rubio we honored [in 2007] was much more of an advocate of the immigrant community,” he said after Rubio announced his position on the census. In the end, Rubio got a majority of the state’s Latino votes in 2010. But that was largely because he won nearly 80 percent of the Cuban vote. He had much more trouble connecting with non-Cuban Latinos, winning 40 percent of their votes, according to exit polls. Rubio’s standing with the non-Cuban Latino community does not seem to have improved since he came to Washington. A few months into office, perhaps in response to pressure from conservative activists, he agreed to co-sponsor a controversial bill from Senator Charles Grassley that would have forced businesses to verify employee immigration status electronically. Liberal immigration advocates oppose the bill, arguing that it has a high failure rate and would drive more jobs into the underground economy. 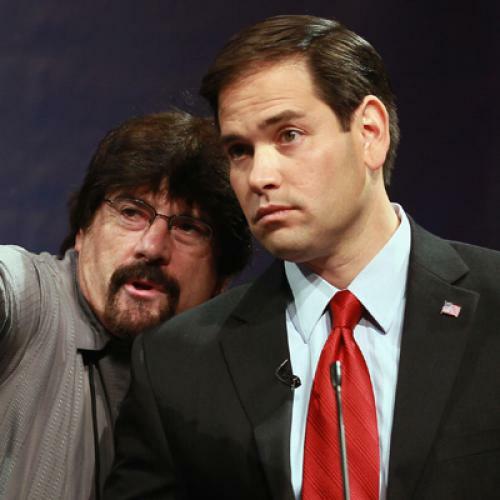 “Rubio is becoming persona non grata among Latinos outside of the Cuban-American community,” syndicated columnist Ruben Navarrette wrote in July. “Hispanics will see him as somebody who betrayed his ethnicity for political gain,” says Juan Zapata, a Republican state representative in Florida with less conservative views than Rubio. Finally, it's also worth noting that even many younger Cuban-Americans in Florida are less likely to vote Republican than are their elders, given their further remove from the historical events that bound their parents and grandparents to the GOP that they felt most strongly reflected their anti-Castro, anti-Communism views. It will be interesting indeed to see how these younger Cuban-Americans -- Marco Rubio's generation, and the next one -- react to his claim that he himself was so removed from those events that he could be excused for getting the dates wrong, even as he wielded his personal relation to the events for its considerable political benefit.